Official homepage of the International Subcommission on Cambrian Stratigraphy (ISCS) a subcommission of the International Commission of Stratigraphy and International Union of Geological Sciences. 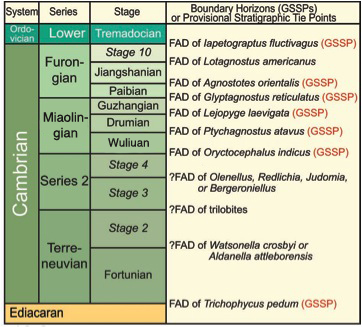 The primary objectives of the ISCS are to define the series and stages of the Cambrian by means of the internationally agreed rules of the ICS and to provide the international forum for scientific discussions and interchange on all aspects of the Cambrian. Special emphasis is put on refined regional stratigraphic correlations using a standard, globally applicable stratigraphic scale.